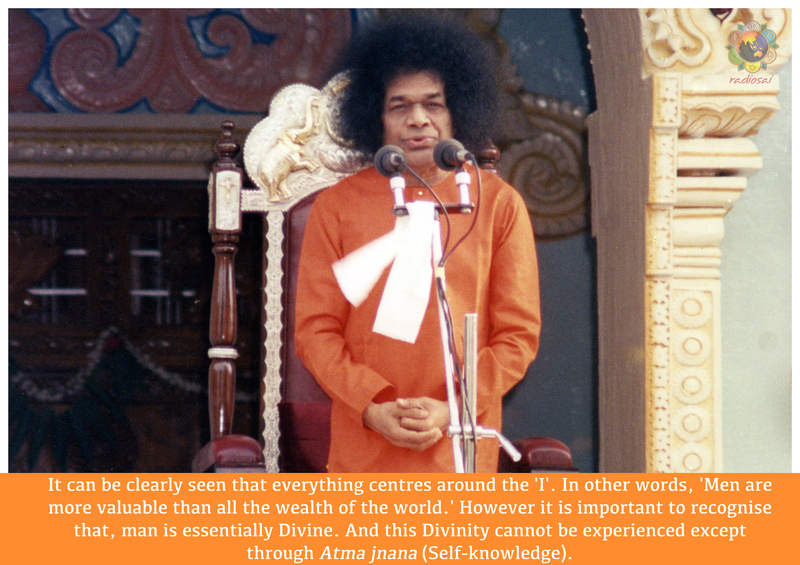 Bhagawan would often say, “My life is My Message.” A simple understanding of this declaration is that He lives every day the message He teaches. One other meaning one could draw is that, ‘His message is His life’! 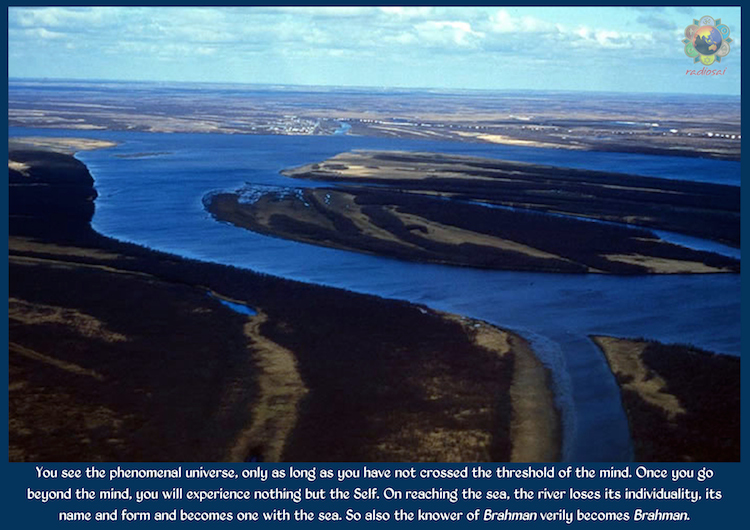 That is, the message that Bhagawan gave is the very life essence of His descent as an Avatar. And the fact that even today, we can go through the thousands of discourses He delivered is in itself a sign of His benediction upon us. And among the discourses Baba delivered, those that He gave as part of the Summer Course series are even more special. This is because often these are a set of discourses centered around a specific theme, elaborated gradually. These are a treasure mine for any sincere spiritual seeker. So in our attempt to encourage more people to dwell deeply into these divine discourses, and contemplate on the message therein, we begin with prayers, a new series today. In March 2013, with the same motive in mind we began a radio series entitled Shravanam Mananam Nididhyasanam. In this live show we began going through the 1990 Summer Course discourses, and needless to say we were overwhelmed by their profundity. So we now wish to offer these discourses to our readers, in this new format. We will try to pictorially depict the messages in these discourses in the form of a poster. These will be sent everyday to all our Sai Inspires subscribers as a link along with the Thought for the Day (If you are not a subscriber yet, please do subscribe). And after these posters are dispatched, they will be added to this page, on the right hand side. You can view, download and even print and use them if you so wish. Also given below is an abridged version of the discourse as published in the Summer Showers 1990 book. We pray to Bhagawan to bless and guide this new endeavour of ours. And we invite you all to partake of and imbibe our Master’s ethereal message. God is more taintless than the sky. The sun, the moon, and the stars are His eyes. He is all-pervading, like the air. It is only when we thoroughly recognise the nature of the upadhis or vestures of man like the body, the senses, the mind, and the buddhi, that we can understand the sacred, pure and infinite Atma or the divine Principle. The knowledge of the kshetra and Kshetrajna is alone true knowledge, in My view. The whole world is a combination of kshetras and Kshetrajna (the fields and the knower of the fields.) 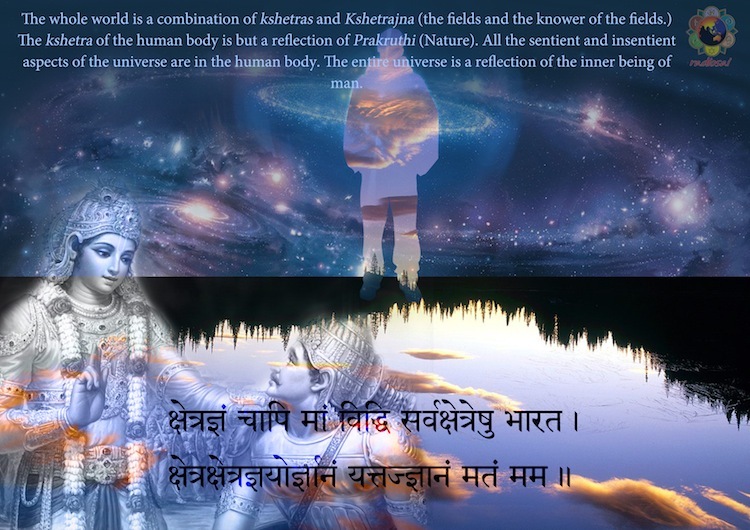 The kshetra of the human body is but a reflection of Prakruthi (Nature). 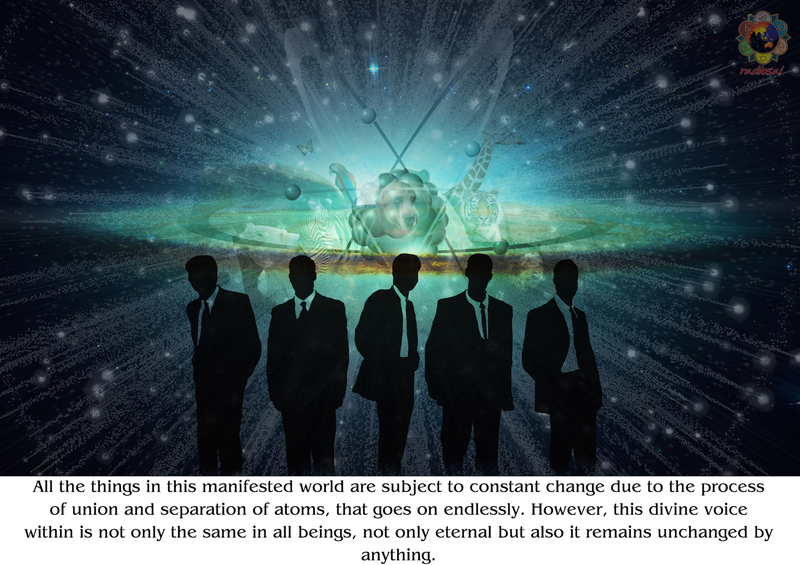 All the sentient and insentient aspects of the universe are in the human body. 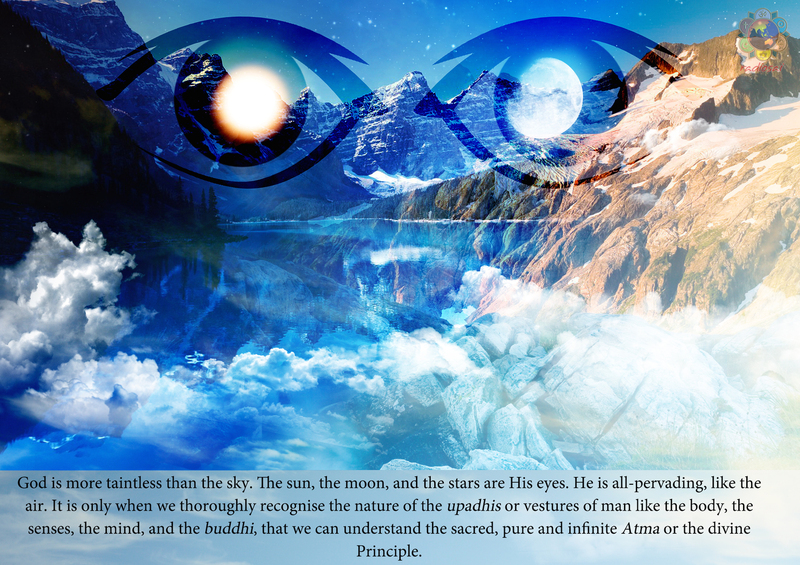 The entire universe is a reflection of the inner being of man. 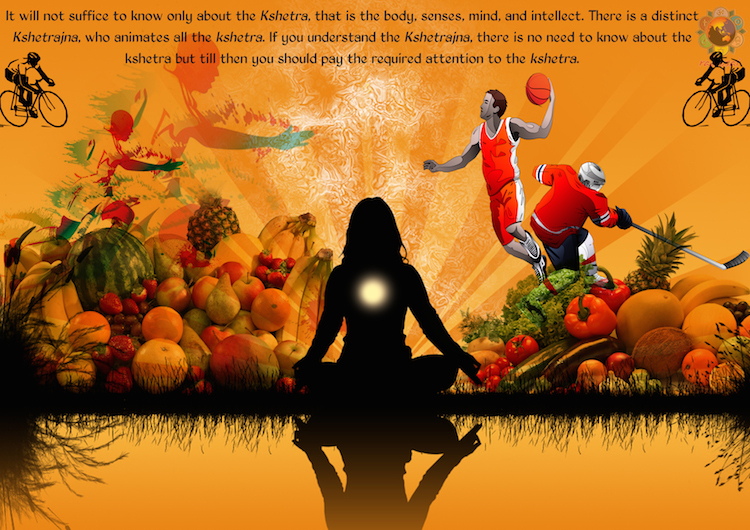 It will not suffice to know only about the body, the senses, the mind, and the intellect. There is a distinct Kshetrajna, who animates all the kshetra. 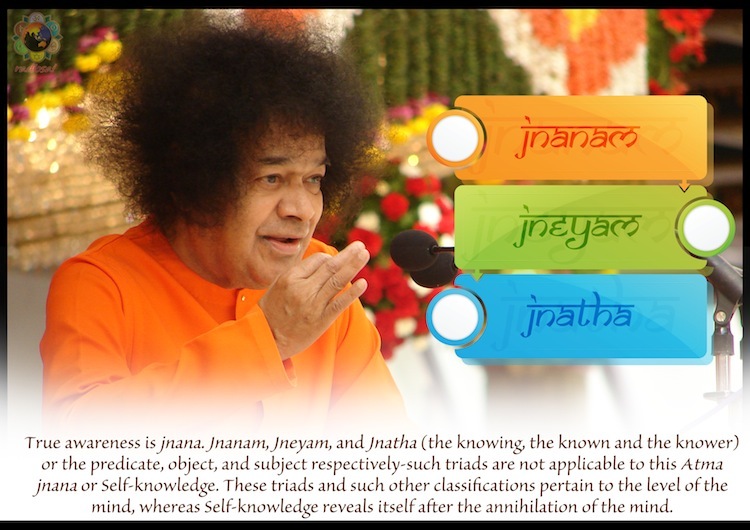 If you understand the Kshetrajna, there is no need to know about the kshetra but till then you should pay the required attention to the kshetra. To understand the Kshetrajna, you need a special kind of knowledge. Book knowledge, superficial knowledge, general knowledge, discriminative knowledge, experience knowledge, practical knowledge —all these pertain to inert matter and mundane things and have an individual bias. 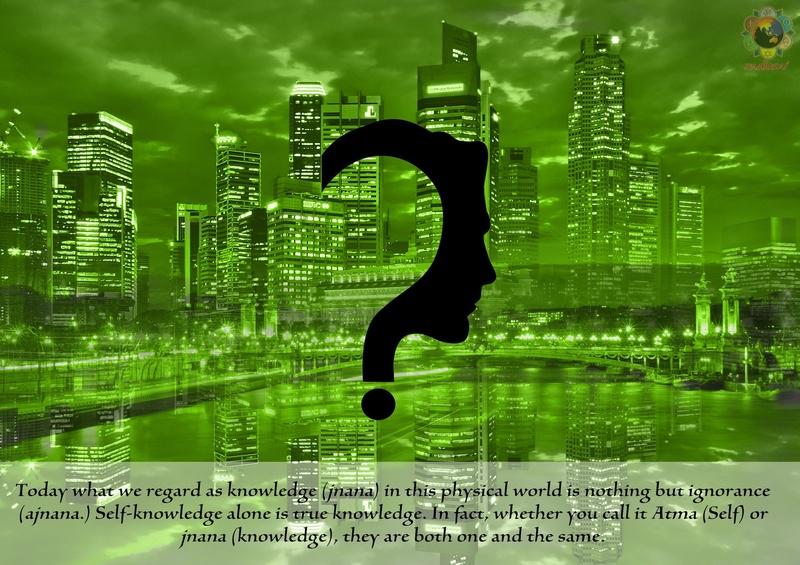 All these kinds of knowledge will not help in understanding the Self. You need a diamond to cut another diamond. You need a thorn to remove another thorn that has pierced your foot. 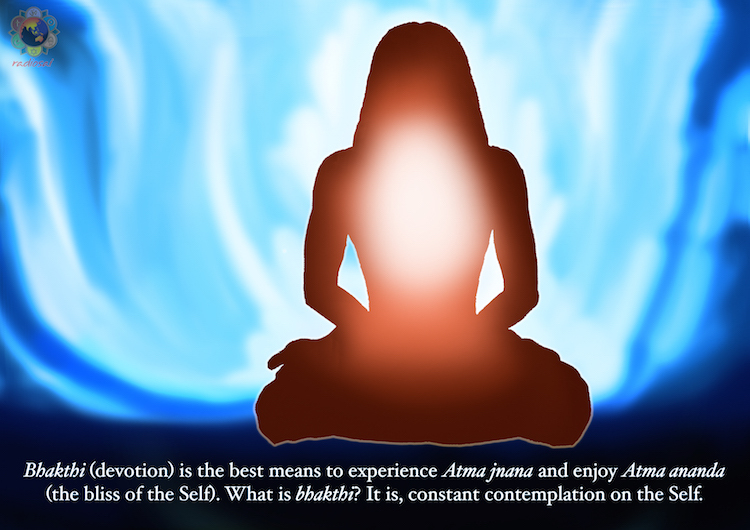 To experience the Self (Atma), you require only Self-knowledge, Atma jnana. Today what we regard as knowledge (jnana) in this physical world is nothing but ignorance (ajnana.) 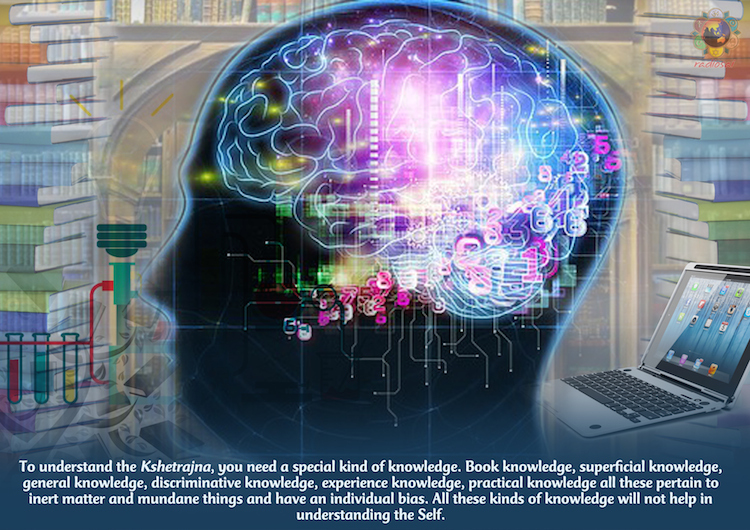 Self-knowledge alone is true knowledge. In fact, whether you call it Atma (Self) or jnana (knowledge), they are both one and the same. 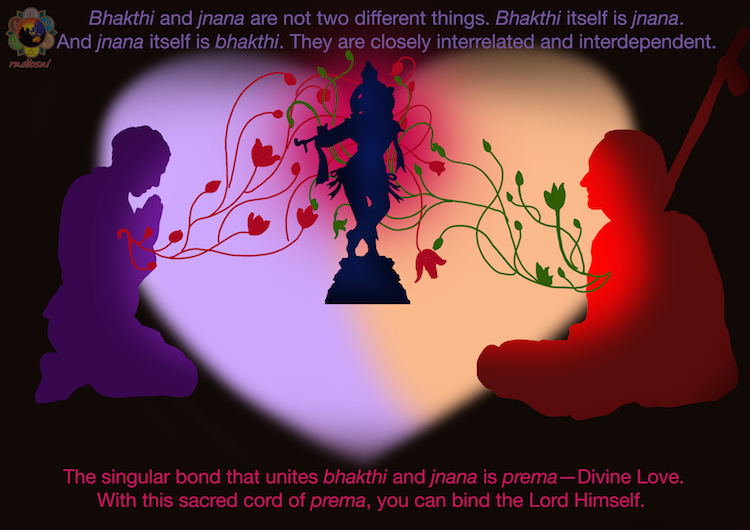 True awareness is jnana. 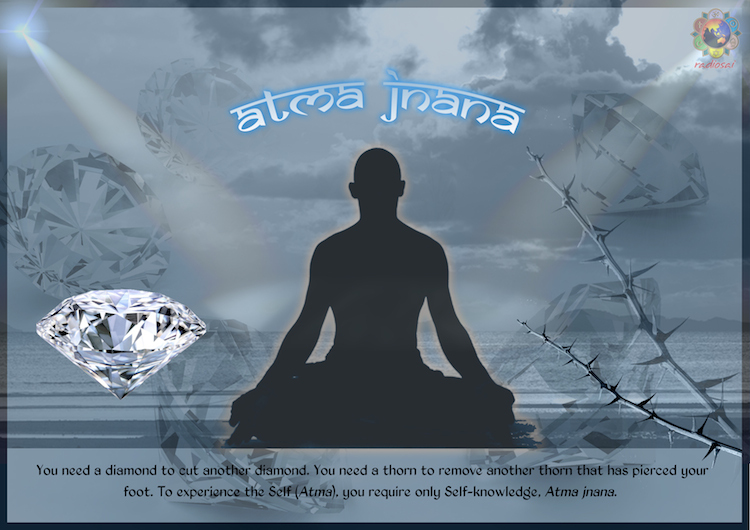 Jnana, jneyam, and jnanam (the knowing, the known and the knower) predicate, object, and subject respectively—such triads are not applicable to this Atma jnana or Self-knowledge. These triads and such other classifications pertain to the level of the mind, whereas Self-knowledge reveals itself after the annihilation of the mind. 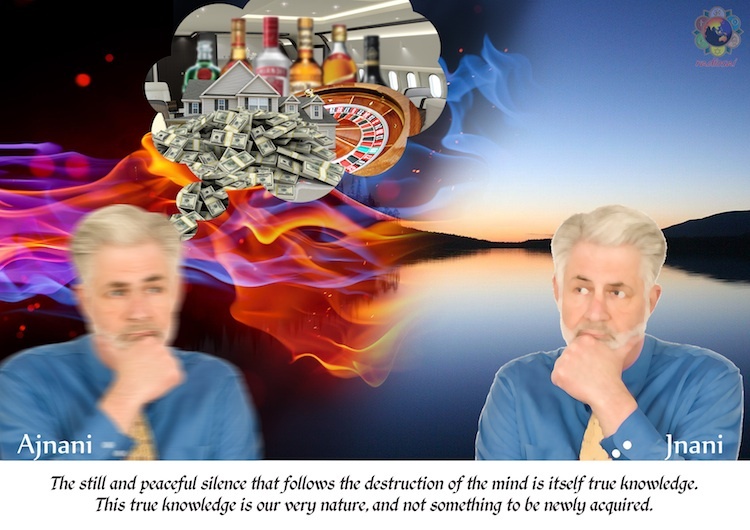 The still and peaceful silence that follows the destruction of the mind is itself true knowledge. This true knowledge is our very nature, and not something to be newly acquired. However, this knowledge is hidden by the mind and its aberrations, like the cinder covered by the ash, generated by the cinder itself, like the water shrouded by the moss produced by water itself and like the eye covered by the cataract arising from the eye itself. Remove the cataract and you get back your sight. Remove the mind and the self-knowledge stands revealed automatically. This knowledge can neither be obtained from books, nor given by gurus (the spiritual teachers) nor can it be conferred as a boon by the Paramatma (the Supreme Soul). Indeed you are yourself Paramatma, Atma, or Jnana. Sitting in solitude, when you calmly enquire how this jnana is present in all, you will hear from within yourself a spontaneous voice that is eternal and changeless. All the things in this manifested world are subject to constant change due to the process of union and separation of atoms, that goes on endlessly. However, this divine voice within is not only the same in all beings, not only eternal but also it remains unchanged by anything. The changes due to the changes in the age of a person, or due to the changing states of consciousness like waking, dreaming and sleeping affect only the gross, subtle and causal bodies, but they do not, in any way, affect the voice referred to above. What then is that voice? 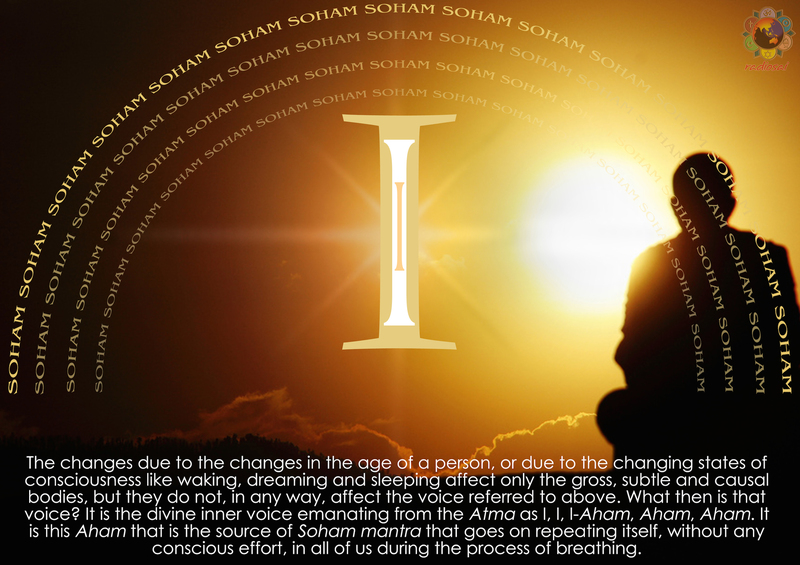 It is the divine inner voice emanating from the Atma as I, I, I—Aham, Aham, Aham. It is this Aham that is the source of Soham mantra that goes on repeating itself, without any conscious effort, in all of us during the process of breathing. It is this Aham again that appears as ahamkara when it identifies itself with the body. Ahamkara is human; Aham is divine. 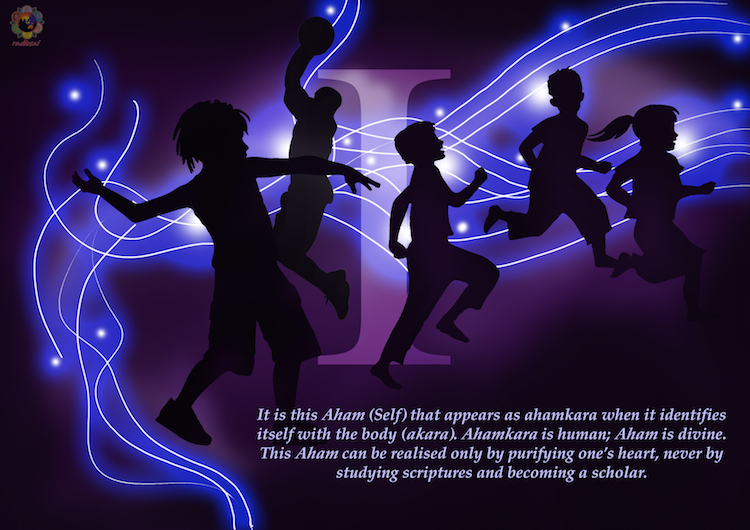 This Aham can be realised only by purifying one’s heart, never by studying scriptures and becoming a scholar. You see the phenomenal universe, only as long as you have not crossed the threshold of the mind. Once you go beyond the mind, you will experience nothing but the Self. On reaching the sea, the river loses its individuality, its name and form and becomes one with the sea. So also the knower of Brahman verily becomes Brahman. 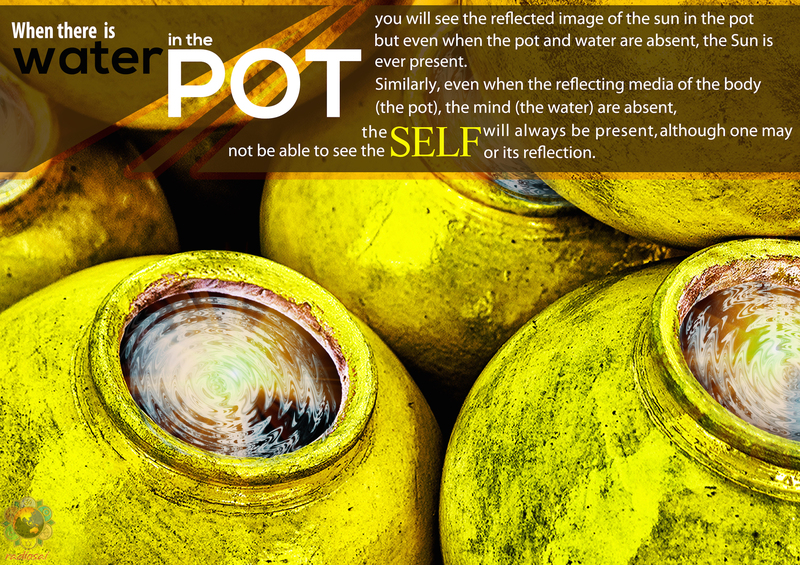 When there is a pot, and also water in the pot, you will see the reflected image of the sun in the pot, but even when all these are absent, the Sun is ever present. 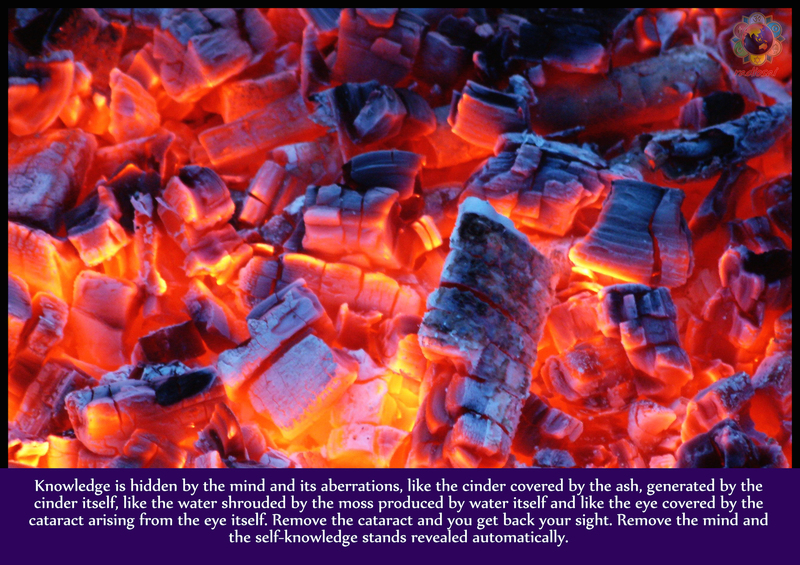 Similarly, even when the reflecting media of the body (the pot), the mind and the water are not present, the Self will always be present, although one may not be able to see the Self or even its reflection. A noteworthy point, in this connection is that the image of the Atma that you get through the media of the body and mind is not true to the original Atma. 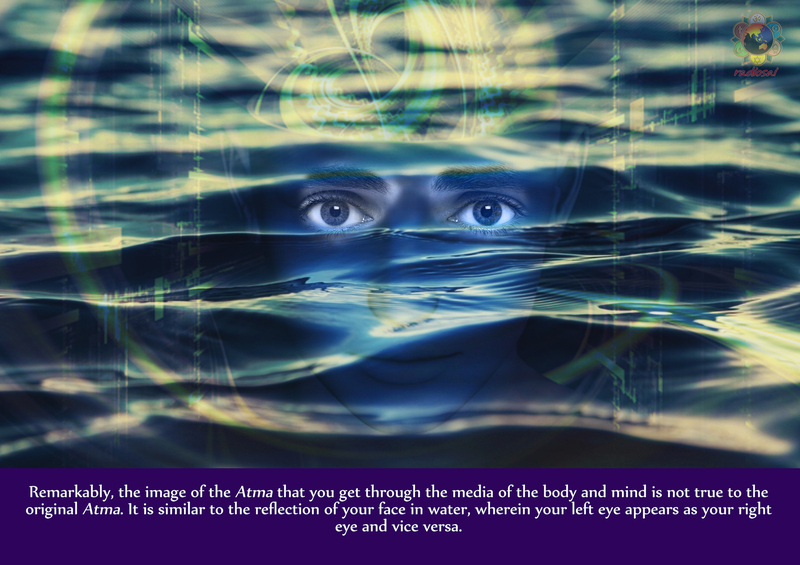 It is similar to the reflection of your face in water, wherein your left eye appears as your right eye and vice versa. 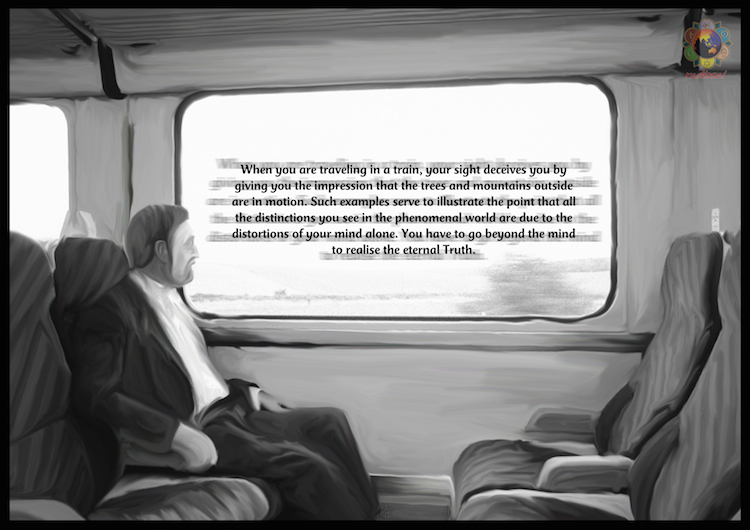 So also, when you are traveling in a train, your sight deceives you by giving you the impression that the trees and mountains etc. outside are in motion. These two examples serve to illustrate the point that all the distinctions you see in the phenomenal world are due to the distortions of your mind only. You have to go beyond the mind to realise the eternal truth. 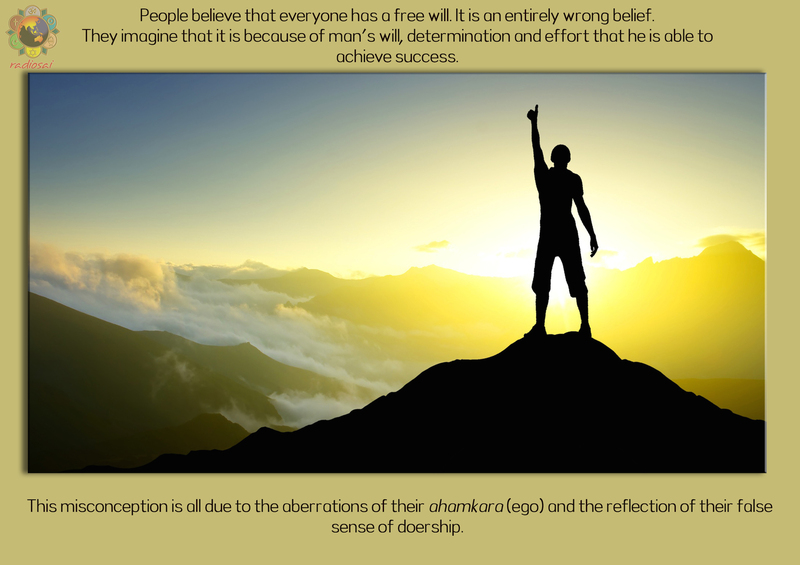 People believe that every man has a free will. It is an entirely wrong belief. They imagine that it is because of man’s will, determination, sadhana, and effort that he is able to achieve success. This is all due to the aberrations of their ahamkara and the reflection of their false sense of doership. 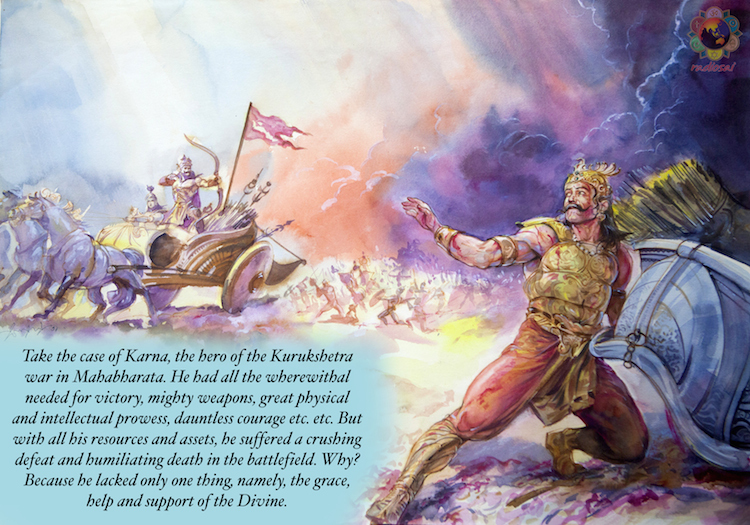 Take the case of Karna, the hero of the Kurukshetra war in Mahabharatha. He had all the wherewithal needed for victory, mighty weapons, great physical and intellectual prowess, dauntless courage etc. etc. But with all his resources and assets, he suffered a crushing defeat and humiliating death in the battlefield. Why? Because he lacked only one thing, namely, the grace, help and support of the Divine. So, even for attaining success in the matter of attaining Self-knowledge, it is foolish to rely on one’s physical, mental, and intellectual abilities and resources. 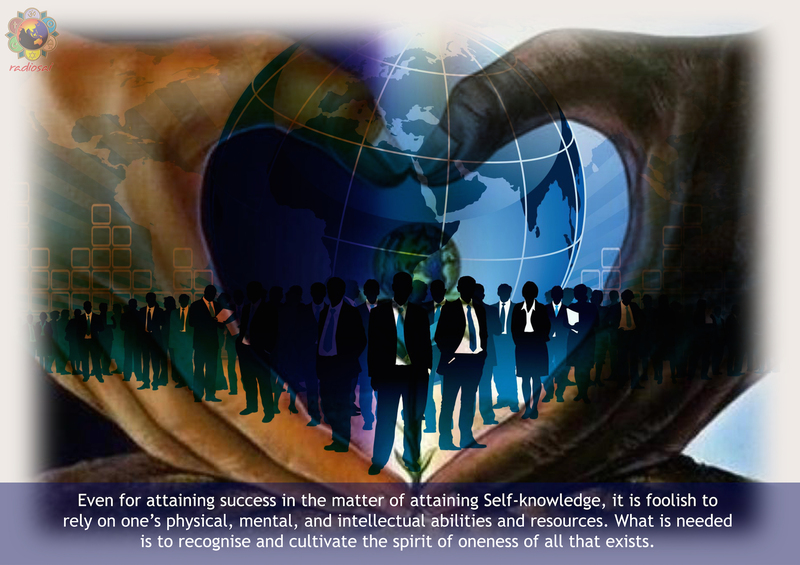 What is needed is to recognise and cultivate the spirit of oneness of all that exists. It is an undisputed fact that today a number of modern facilities, conveniences, and gadgets like aeroplanes, automobiles, cinemas, television sets, computers, radios, and videos, etc. are available in plenty. 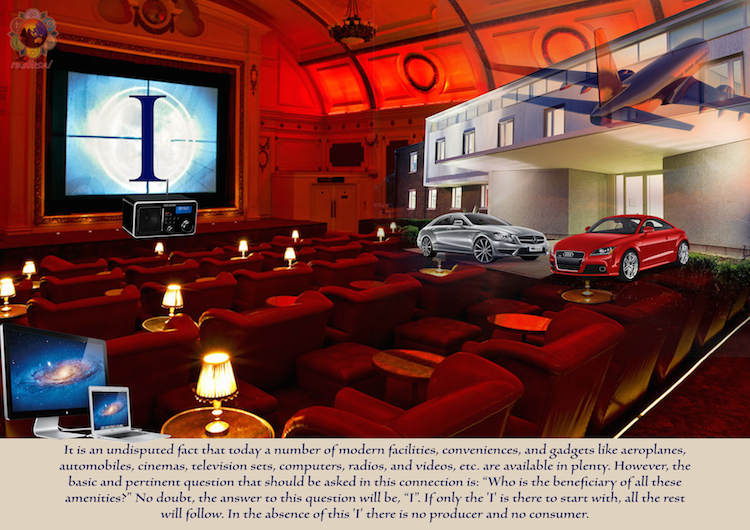 However, the basic and pertinent question that should be asked in this connection is: “Who is the beneficiary of all these amenities?” No doubt, the answer to this question will be “I”. If only the “I” is there to start with, all the rest will follow. In the absence of this “I” there is no producer and no consumer; hence, no need to produce. Thus, it can be seen that everything centres around the “I”. In other words, “Men are more valuable than all the wealth of the world.” However, it is important to recognise that, man is essentially divine. And this divinity cannot be experienced except through Atma jnana (Self-knowledge). 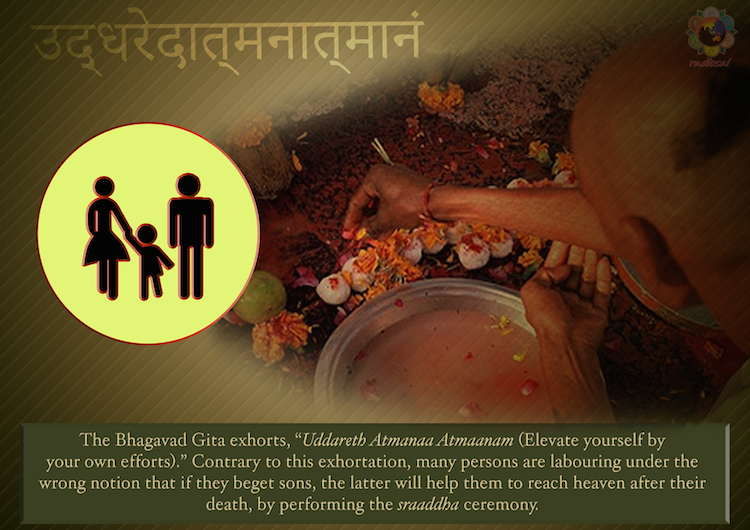 The Bhagavad Gita exhorts, “Uddareth Atmanaa Atmaanam (Elevate yourself by your own efforts).” Contrary to this exhortation, many persons are labouring under the wrong notion that if they beget sons, the latter will help them to reach heaven after their death, by performing the sraaddha ceremony. It is foolish to think that those having sons reach the higher worlds and those having no sons will go down to the nether worlds. Further, sraaddha does not mean inviting the Brahmin priest, washing his feet, feeding him sumptuously, and obtaining his blessings. 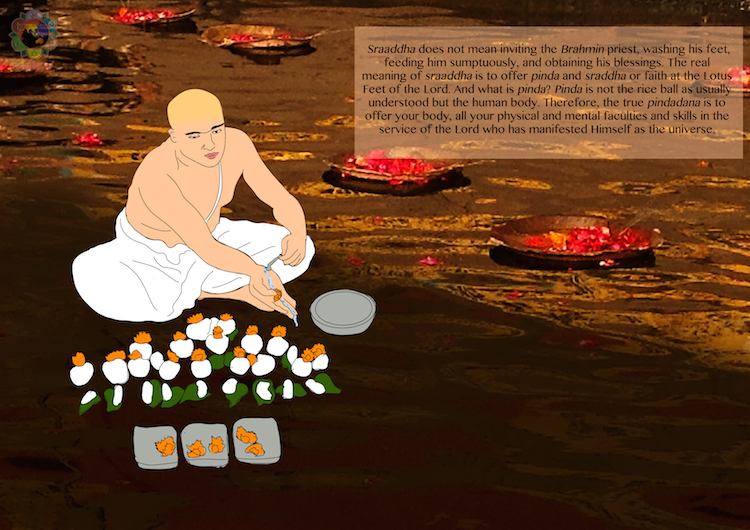 The real meaning of sraaddha is to offer pinda and sraddha or faith at the Lotus Feet of the Lord. And what is pinda? Pinda is not the rice ball as usually understood but the human body. Therefore, the true pindadana is to offer your body, all your physical and mental faculties and skills in the service of the Lord who has manifested Himself as the universe. In Vedantic parlance, the human body is also called “tunga-bhadra”. Tunga means very high, vast, great etc. Bhadra means good, sacred, auspicious, effulgent, etc. The implication of calling the human body “tunga-bhadra is that it is intended to undertake such noble activities as will bring about the welfare of the society. Therefore, to be worthy of this name, you should dedicate your body and mind to the loving service of all beings. In this context, you must remember the shining example of the great musician, Saint Thyagaraja, who proved himself worthy of his name, which literally means the “King of renunciation”. When the ruler of Tanjavur sent him a number of precious jewels and provisions necessary to run a household, he refused to accept them and sang extempore, addressing his mind thus, “Oh my dear mind! What is it that gives real happiness, wealth or the Lotus Feet of the Lord? Please tell me the truth.” Then he also sang a prayer to the Lord as follows, “Oh my beloved Lord Rama! Do you want to tempt me with these riches, and make it an excuse for deserting me? I have held fast your Lotus Feet with both my hands. 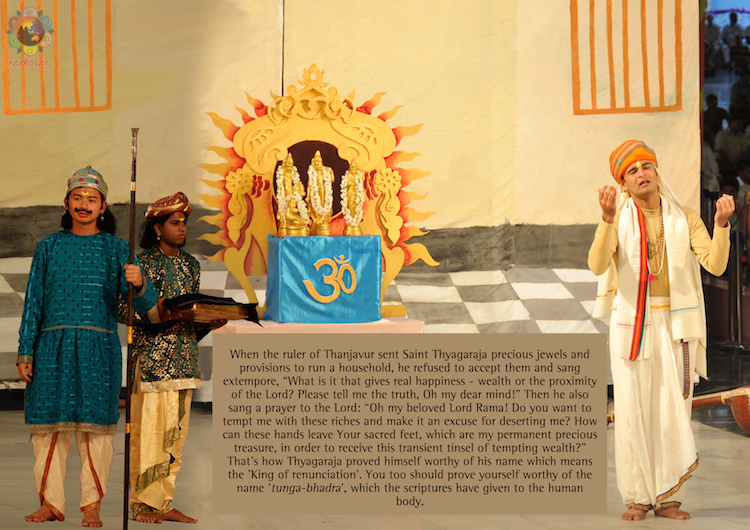 How can these hands now leave your sacred feet, which are my permanent and precious treasure, in order to receive this transient tinsel of tempting wealth?” Therefore, just like Thyagaraja who proved himself worthy of his name, you should also prove yourself worthy of the name “tunga-bhadra”, which the scriptures have given to the human body. Students! 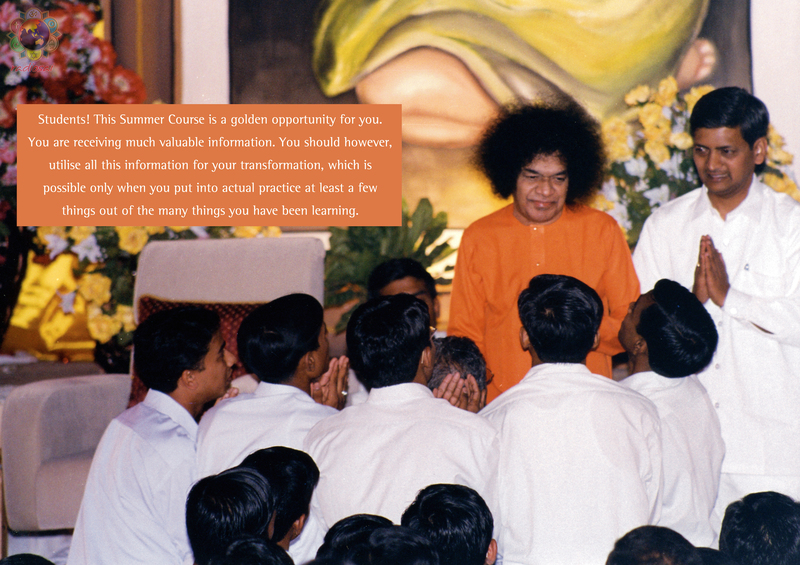 This Summer Course is a golden opportunity for you. So many elderly and eminent persons with rich experience behind them are giving you very valuable information. You should, however, utilise all this information for your transformation, which is possible only when you put into actual practice at least a few things out of the many things you have been hearing. What do you think about this series? Please let us know by writing in to [email protected]. Do not forget to mention your name and country.